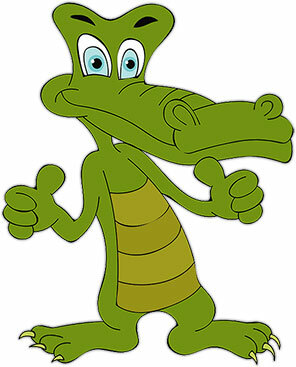 This alligator category has many variations of animated alligator gifs and alligator clip art images. We have alligators chomping, alligators cooking, gators walking and gators dancing. Pages also include alligators running, gators relaxing, sunning, alligators waving and we even have a few crocodiles. Section includes large photo alligator images plus black and white alligator clip art ready for print and color. 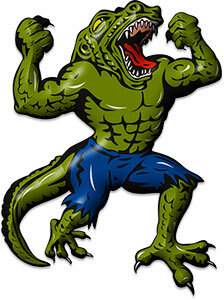 Click on the large alligator clipart images for print view. 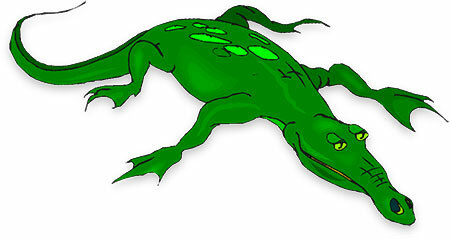 Hungry alligator - photo clipart image. Who said four legs are better than two? Alligator with big teeth and mouth open. Happy alligator ready to save or print and add color. An alligator from days gone by. Alligator keeping a close eye on you. Alligator playing a sad song. Fun alligator on the run. Alligator sunning on the bank. 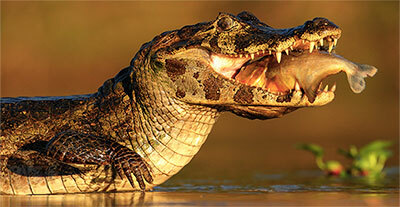 America and China are the only countries where alligators are native. In the United States alligators can be found in Florida, Georgia, Louisiana, Alabama, South Carolina, North Carolina, Mississippi, Texas, Arkansas and Southern Oklahoma. There are millions of gators in the wild. Over 2 million in Florida and Louisiana alone. The Yangtze River Valley is the only known location of the endangered Chinese alligator. It is estimated there are only about 120 left in the wild (4-26-2011, National Geographic News Watch). Update March 9, 2014: Chinese alligators are being bred in captivity in China at the Anhui Research Center for Chinese Alligator Reproduction and the Changxing Nature Reserve and Breeding Center for Chinese Alligators. Captive breeding is also carried out at other sites including the Bronx Zoo in New York and the St. Augustine Alligator Farm Zoological Park in Florida. According to a 2013 report by the Changxing Nature Reserve (CNRBRCCA) there are now over 10,000 Chinese alligators in captivity. Some have been released back into the wild in China. January 22, 2016: Conservation Status of Alligator Sinensis (Chinese alligator) - Critically Endangered. 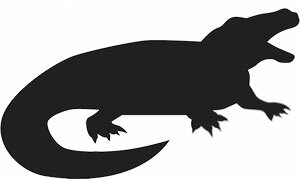 April 16, 2018: According to the International Union for Conservation of Nature and Natural Resources (IUCN) the Chinese alligator remains on the critically endangered list. Updated information is hard to come by however, we can point out that captive breeding of Alligator Sinensis continues at the Memphis Zoo, Cincinnati Zoo, Toledo Zoo, St. Louis Zoo, Philadelphia Zoo, San Diego Zoo and the Smithsonian National Zoo. Some gators hatched at these locations continue to be reintroduced into the wild. 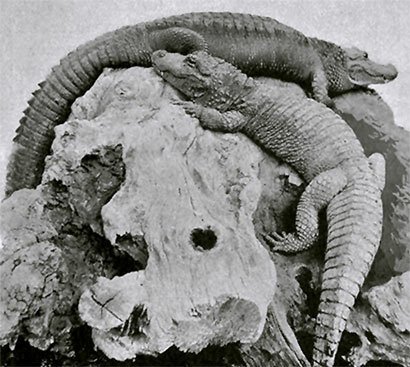 This is a 1905 photograph by C. J. Cornish (public domain image) of an American and Chinese alligator together. The one on top is the American. Alligator showing off his new threads. Alligator Man coming to a theatre near you. Well, perhaps not. Swimming in the nile with an alligator (crocodile). Not a good idea. 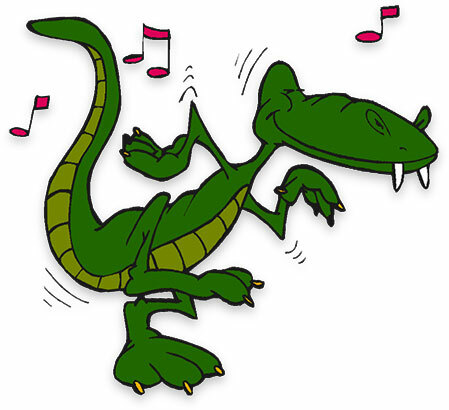 Alligator dancing to the music. Alligator getting the heck out of there. Laid back and relaxed gator. Alligator silhouette black on white JPEG. Crocodile making a snack out of a large fish. 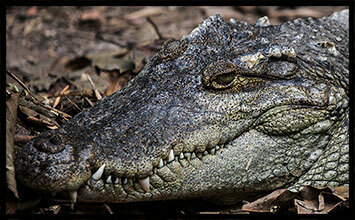 Chinese crocodile keeping a close eye on you. 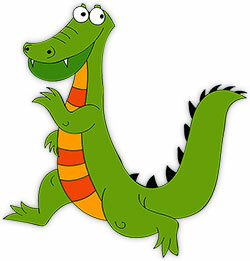 If you use our free alligator clipart, please give us credit. Thank You.